MEMPHIS MAY FIRE have announced a late winter/early spring headlining North American tour, dubbed "March Of Madness". 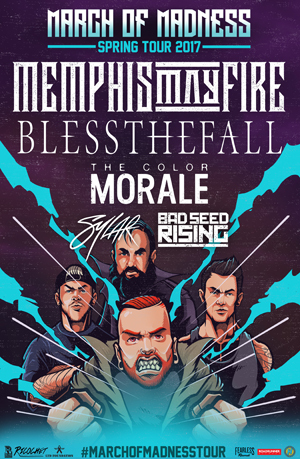 MMF will be joined by BLESSTHEFALL, THE COLOR MORALE, SYLAR, and BAD SEED RISING on this trek. Tickets go on sale on Friday, February 3 at 10AM local time. However, VIP packages will be available HERE and a portion of every VIP package sold goes to the LTD Foundation. The LTD Foundation bridges the music industry together with fans who have terminal diseases to help change their perspective on life through the healing power of music by delivering all access VIP experiences with their favorite bands. The band's latest album This Light I Hold was released this fall through Rise Records.